of Marie Mallory and team! Our goal is to help you feel and look your best through excellent skilled dental care using healthy choices in materials and techniques. There is an ever-growing awareness that the health of the body and mouth are closely related. Our holistic approach to dentistry means that we work with the inter-related effects on the whole body of modern dental technology combined with ageless traditions of natural healing. We know a warm, listening and mutually informed relationship with our patients also promotes healing and long-term health. 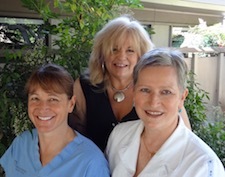 Our office provides Orthodontic dentistry with a holistic approach. Please click here to learn more about our Orthodontic dentistry. In addition to concerns of biocompatibility, when choosing a restoration we have to consider the size of the defect to be repaired, the function of the tooth and surface involved, and whether the strength of the tooth has been compromised by prior decay or fillings. The strength, durability, and cosmetic acceptability of the material to be used are also considered. In our office, silver mercury "Amalgam" fillings are not used due to toxicity concerns. The World Health Organization recently concluded that the daily intake of mercury from amalgam dental fillings exceeded the combined daily intake of mercury derived from air, water and food (including fish) Please click here to learn more about our restorative work. New Financial Options: Many patients put off treatments and procedures because they cannot afford to pay. We now offer CareCredit payment plans as a convenient option to normal credit cards, cash or checks. CareCredit allows the patient to pay over time often without incurring interest charges instead of a lump sum prior to treatment. Click here for more information. FOR YOUR CONVENIENCE Our office accepts Visa, Master card and Discover credit cards and most major insurance companies.